The figures come from design documents now filed with the Federal Environment Department, in which the company says it wants the massive Browse LNG project to fire up in the second half of next year, and continue running for half a century. The project, located 425km north of Broome, will consist of three floating LNG factories and a floating hotel (a ‘flotel’) to house workers during construction. 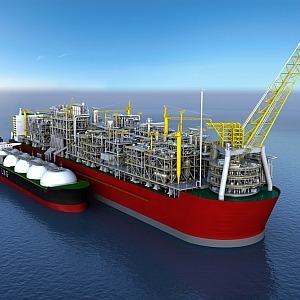 The three massive facilities will operate across two main drilling fields in the ocean off Western Australia. Woodside says when the operation is fully underway it expects to produce 3.9 to 4 million tonnes of LNG per annum, a rate of around 17,000 barrels per day. Each of the three floating LNG vessels, measuring over 500 metres long, will employ just 120 people per ship when they are running. The low amount of people involved has been both the reason for and the main criticism of the project. Investors say the price of producing gas onshore is prohibitively high, largely due to the wages of a larger workforce. Doing it at sea cuts several parts of the process and combines in single sites, meaning fewer people can be employed, costs are kept down and investors are more willing to pour in funds. But Western Australian Premier Colin Barnett remains strongly opposed to Woodside’s offshore option. He says it will lead to less jobs, more safety risks and reduced investment opportunities for the state. The latest papers submitted to federal authorities discuss design parameters for front end engineering and design (FEED) of the FNLG facilities and associated infrastructure, which investors Mitsui, PetroChina, Shell and BP indicated was the preferred (and cheapest) option during early talks last year. A recent comment from Shell, which has a 27 per cent stake in the Browse project, stated they believe FLNG is the only LNG option left for Australia due to the unfavourable cost of onshore projects.